The Norwegian Glacier Museum in Fjaerland, Norway has been compared to a flying saucer nestled between the mountains of the Fjaerlandsfjord. A boat from Balestrand through the green waters of the fjord and a bus ride to Jostedalsbreen National Park will get you to your destination. At first glance, the architecture created is both part of and otherworldly to its environment. Designed by Norwegian architect Sverre Fehn, the museum was initially constructed in 1991 on land that was carved out by the Jostedal Glacier — the first thing you learn is that breen means "glacier" in Norwegian, so don't be redundant by sayng "Jostedalsbreen Glacier." Examining this Sverre Fehn museum is a look inside glaciers, climate change, and the architect himself. Sverre Fehn (born August 14, 1924 in Kongsberg, Norway) received architecture's highest honor, the Pritzker Prize, in 1997.His Pritzker biographers noted that the "Glacier Museum has been hailed as a major landmark in contemporary architecture." Fehn's design for the museum maximizes space with geometric forms. Along each side of the Norwegian Glacier Museum, two massive stairways rise to a roof-top overlook. A sloping roof over the entryway creates the illusion of enormous distance. The long entryway leads the visitor to interior exhibition spaces or up the stairs to an exterior viewing platform. The canopy is triangular while the exhibition area is circular. All the while, craggy mountaintops hover. Along one side of the Glacier Museum, a round chamber holds the Ulltveit-Moe Climate Centre, a Fehn-designed addition that opened in 2007. Visitors to the Centre can witness climate changes since earth's creation and can view the devastating effects of global warming. "The globe is divided in longitude and latitude degrees," Fehn said as he accepted the Pritzker Prize. "And each crossing point has its certain climate, its certain plants and winds. As an architect, you have to try to understand the difference of life in each point." Norwegian architect Sverre Fehn gave the Glacier Museum sharp, angular shapes to suggest the jagged forms of the surrounding mountains and glaciers in Fjaerland. The architectural design idea was formed from his schooling and early experiences. Fehn graduated from Architectural School of Oslo in 1949 where he was influenced by Norwegian modernist architect Arne Korsmo (1900-1968). Fehn interned with French designer Jean Prouvé (1901-1984), experiencing 1950s European modernism firsthand as Le Corbusier was at the height of his own career. Architect Andrew Todd writes that Fehn "succeeded in finding a path between the opposing dogmas of hi-tech and brutalism which these two figures came to represent, distilling instead a poetics of construction from Prouvé and a concern for the primitive from Le Corbusier." 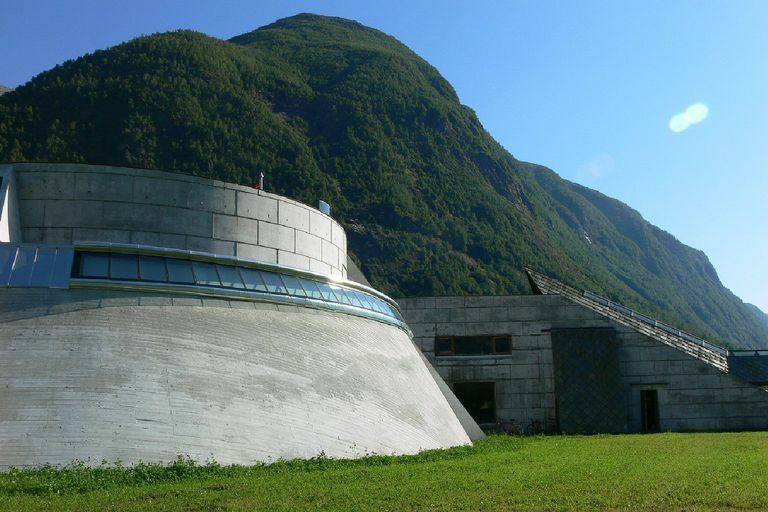 Critics of the Norwegian Glacier Museum say that it resembles an air-raid shelter or a military bunker. But architect Sverre Fehn selected the rugged gray concrete to harmonize with the Fjaerland mountains and glaciers. Climbing the steep stone stairs of the Norwegian Glacier Museum, visitors may have the sense that they are ascending into the mountains of Fjaerland. "Within himself, every man is an architect," Fehn has said. "His first step towards architecture is his walk through nature." From the roof of the Norwegian Glacier Museum, visitors have sweeping views of the mountains and glaciers of Fjaerland, Norway. Architect Sverre Fehn spent time in Morocco in the 1950s. His contemporary, the Danish architect Jørn Utzon, encouraged Fehn to learn about earth building and the vernacular architecture of what Europeans considered a more primitive community. Fehn took away many lessons from the experience, including that "houses literally grow out of the ground they are built on" and that "the different parts of a house are objects for use." The stone, wood, and glass architecture of the museum moves into and out of the surrounding mountains, like a glacier itself. The roof of the interior exhibit hall becomes an exterior area for real life exhibits. Exhibits, films, and interactive displays at the Norwegian Glacier Museum illustrate the relationship between man and nature. The space designed by Fehn was renovated in 2016 to include even more hands-on demonstrations and current event presentations, such as What is global warming? What is a glacier? and Why is the fjord green? The Cafe at the Norwegian Glacier Museum is a sunlit space with stunning views of the mountains of Fjaerland, Norway. The windows of the Norwegian Glacier Museum have mitered glass that creates the crystaline effect of fractured sunlight. In his design for the Norwegian Glacier Museum, architect Sverre Fehn (1924-2009) used glass and rugged gray concrete blocks to echo the color and texture of the mountains and Jostedal Glacier. "But the great museum is the globe itself," Fehn has said. "In the surface of the earth, the lost objects are preserved. The sea and the sand are the great masters of conservation and make the journey into eternity so slow that we still find in these patterns the key to the birth of our culture." Norsk Bremuseum has become a destination not only for experiencing prize-winning architecture, but also for learning how we can best save the earth for humanity's survival. Hyatt Foundation, The. Sverre Fehn 1997 Laureate Biography. 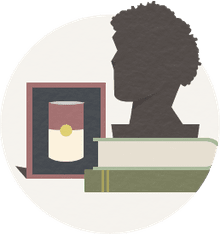 Note: As is common in the publishing industry, the writer was provided with complimentary accommodation for the purpose of researching this article. While it has not influenced its content, ThoughtCo believes in full disclosure of all potential conflicts of interest. For more information, see our ethics policy.